Few need an excuse to make garlic bread; fewer still can resist it. One way to make it even more dangerously habit-forming is to use bread that already has garlic in it! I know what you’re saying; “Where oh where can I find bread with garlic as a main ingredient?” Luckily we have the answer. Our Whole Clove Garlic Loaf is steeped in the stuff – proof being, as the package says, there’s not a single vampire in our bakery. The questionable existence of vampires aside, our Whole Clove Garlic Loaf makes for a Cheesy Garlic Bread recipe that you’ll be tempted to think is a meal on its own. But for good measure throw in a spicy pasta dish as the main course – we’d hate to think we put spaghetti out of business. Preheat oven to 350ºF. Slice the garlic loaf in half lengthwise and place on a lined baking sheet. In a small bowl, combine butter and parsley. Spread evenly on each loaf half. In a large mixing bowl, mix together Mozzarella, Cheddar and Parmesan cheeses. Sprinkle evenly over the bread, followed by remaining parsley. Bake until the cheeses are melted and beginning to brown (approximately 20 minutes). 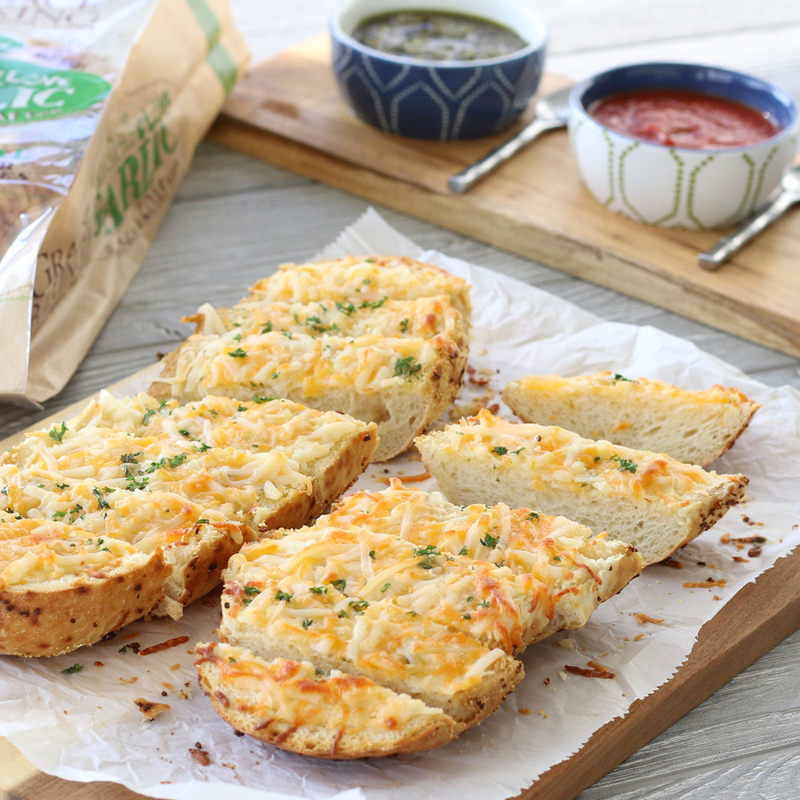 Slice the cheesy garlic bread and serve with dipping sauces.